Imagine a beautiful field with lovely thick and rich grass. There are wild flowers present and a brook flowing with crystal clear spring water. Dotted throughout the landscape are sheep – happy, oblivious sheep. You are observing this picture from a prison window complete with iron bars and find yourself thinking, “If only I could be like one of those sheep, but alas I am here in prison bound to this cold, damp and dark place.” The odd thing is however, that the prison door is open. You could walk right through the door and enjoy the lush green field. But you do not because fear holds you in this prison and you can only wish yourself elsewhere. But, it sure feels true to you. Why? Fear is a prison, a prison of self. The Bible reveals to us that the truth sets us free. 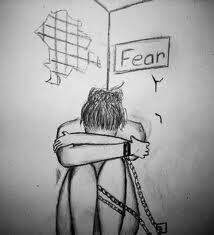 Fear, often generated by a lie, is imprisoning so many people today that they fail to discover their potential, their gifts and their passions. Fear keeps them from dreaming and quickly ends any thought of freedom. Fear gripped many in the Bible. One verse in Job stands out to me, “Fear and trembling seized me and made all my bones shake.” (4:14) David often felt fear around his enemies. But it was David who wrote, “Even though I walk through the valley of the shadow of death, I will fear no evil, for you are with me.” (Ps. 23:4) David, a shepherd, also knew The Shepherd who would let him walk out of the prison of self-imposed fear and be restored beside the quiet waters flowing through the green pastures. He is with you. Fear has a way of distorting reality. Have you ever been to a scary movie? It’s not real – you know it’s not real, but your heart is beating faster, your palms are sweaty, your body is becoming tenser and your tongue is getting thicker. The emotional reaction of fear has literally changed your heart rate and physiological make-up. Remember those scary nightmares as a child or the “monsters” under your bed? Never once were they real, but your body sure was fooled. How so? Your mind, the voices from your past, coupled with your beliefs created a non-reality and then made a reality simply by self- generated thought. Fear is a reaction to a thought and, quite honestly, that thought does not have to be true. 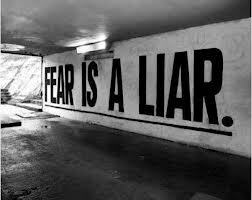 Most fear is actually created by what we tell ourselves concerning a past incident or the future. If we tell ourselves that public speaking is fearful, it will be. Don’t get me wrong; fear is not always a bad emotional reaction because sometimes it’s based on truth. If someone robs you at gunpoint, fear will be a part of what you deal with along with perhaps some post stress disorder. That fear is based on a reality and meant to protect us. But fear can take on a life of its own. It can be something that we accept as normal to our life when in fact it is inhibiting us from growth. We can walk in fear of the future, fear of the loss of employment or fear of failure. 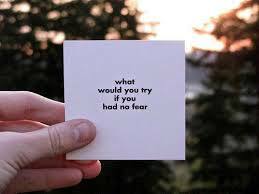 What fears can you identify in your life and how have you attempted to deal with them? Author Andy Stanley has said that fear is a common ground that all of humanity shares. His statement caused me to stop and consider this observation with a bit more thought. I came to the conclusion that I think it’s true. Recently I have been talking to a friend who is experiencing an unexpected interruption in his health and it has been scary for him as the medical profession attempts to bring him diagnosis for treatment. I had the opportunity to take a call from a friend of many years ago and he is now facing a possible divorce. I lost count of how many times he mentioned the word “fear.” As well, I have dealt with a couple that have some severe, long-term dysfunction in their marriage relationship and the wife is gripped with fear – fear of yesterday, today and fear of the future. The opposite of fear is not the lack of fear; it’s love. Fear is absent within the presence of love. Where there is a spirit of love, there will not be a spirit of fear. Fear and love never share the same bed. The Bible reveals that perfect love actually casts out fear. If the enemy can keep us in fear, he can keep us from receiving the love of God. Fear is a motivator for sure, but the wrong type of motivation. I recall as a child, being afraid of authority as the norm. Back in the day, it was seen as a healthy fear. But then, my natural conclusion was to be afraid of God, the ultimate authority of my life. That could not have been “healthy.” The love of God is an even greater motivator. Love inspires, accepts, gives grace, allows mistakes and motivates us to do better and grow. Fear hinders growth, causes us to give up, is not safe and keeps us from emotional closeness. Which one motivates you the most: fear or love? It seems a lot of people like receiving ideas of how to maintain our love, spontaneity and keeping boredom at bay in our marriages. So, here are a few more ideas generated from our book pre- and postmarital workbook, Called Together.